An inmate argued with one of his alleged killers over a parcel the day before he was stabbed to death at Pentonville Prison, a court has heard. 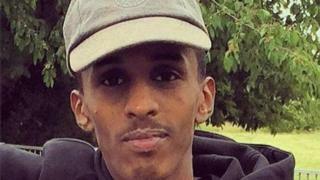 Jamal Mahmoud, 21, was fatally stabbed on 18 October last year in a row over contraband smuggled into the north London jail. Basana Kimbembi, 35, Joshua Ratner, 27, and Robert Butler, 31, all deny murder. An inmate told the Old Bailey that Kimbembi "pulled a knife out" during the argument with Mr Mahmoud. Giving evidence anonymously, the man who went by the name of Bobby Dorset, spoke behind a screen and with his voice modulated to disguise his real identity. He told the jury that Kimbembi and Mr Mahmoud were "arguing... over a parcel that came into the prison". Mr Dorset said he saw Kimbembi hold up a knife which was up to 15in (38cm) long and "told Jamal to get out of the cell". He added: "As Jamal walked away he said 'OK we will see what happens'." Kimbembi, Ratner and Butler also deny attacking another inmate causing him grievous bodily harm.